This product works well on my daughter's long hair. It lathers well, doesn't cause any irritation to her eyes, and rinses out easily. The absolute best thing about it is how amazing it smells! I absolutely loved using the Burts Bees Shampoo and wash for my baby boy. The fact that this is free of so many harmful additives is an added bonus. My son used to be really prone to eczema, cradle cap and dry patches as a baby. This wasone of only two brands that I could use on him that wouldnt irritate his delicate skin, the other being the Live Clean! He is almost five now and he still uses it. Highly recommended! I highly recommend this product- especially having littles! Only have to use a small amount for it to be effective. I’d tried two other baby shampoo/body wash combinations before hand and found I was using way more than I should have needed. They also offer regular and lavender- love the lavender for before bed time baths! Totally helps calm my little one. My husband uses it as well! He has trouble with finding a wash that works for his sensitive skin but loves this one. It would be nice if they offered a larger bottle for purchase- that’s the only thing I don’t like about the product. I can’t buy more of it at a time! I have been using this product for my kids from day 1. After using Burts bees shampoo and wash my kids skin feels soft. I recommend this product to my friends as well, when they didn't like other kids body wash. So gentle, with such a great scent! My son has very sensitive skin, and we have had a very hard time finding a shampoo or body wash to use for him that he does not react to. The Burt's Bees line has never let me down! It smells terrific, and I never have to worry about his skin breaking out or becoming itchy and irritated. 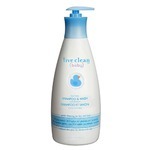 This is the only shampoo and body wash to date that does not irritate my sons sensitive skin. It doesn’t dry him out and the scent is nice and light. It even seems to be helping his cradle cap. Will definitely be investing in the rest of this long of products. First of all, I love Burt's Bees products! When I was expecting my son I made sure to pick up a Burts Bees shampoo and body wash for him. I love all in one washes, especially for babies, it makes things so much easier! I love the smell of this product so clean and fresh. I love the clean ingredients of burts bees shampoo and body wash as well, its so nice knowing I am keeping my baby away from harmful ingredients that tend to be in baby care items. I have used this baby soap for 7 years, and keep going back. I love the quality, how gentle it is on babes skin, and the ingredients. I even started using it for myself when I developed sensitivities and have never had an issue with it. A great product and a little goes a long way! I like the fact that burts bees has stuff that is sutable for newborns. I wish their was a combo package for new mothers thag came with the shampoo, lotion and diaper rash ointment. Its a perfect welcome home kit for new mothers like myself. I absolutely adore this baby wash! Its smells like honey and babies. Its extremely gentle and is tear free too. The calming scent is always a treat at bedtime for all of us.